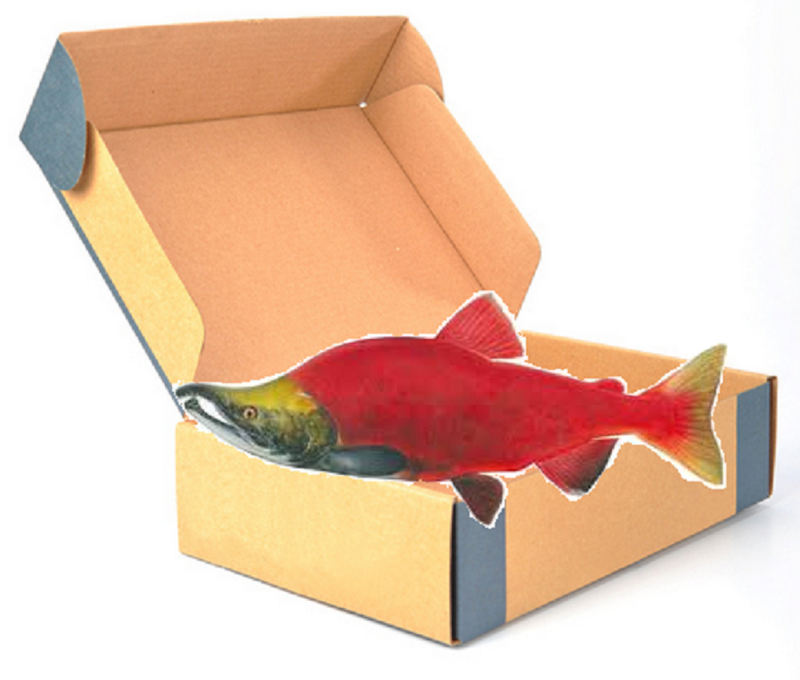 I admit that nothing sounds less appetizing than salmon cooked in a package. It arouses images of cardboard boxes bound with duct tape, spiders crawling all over it while it is left on the doorstep. 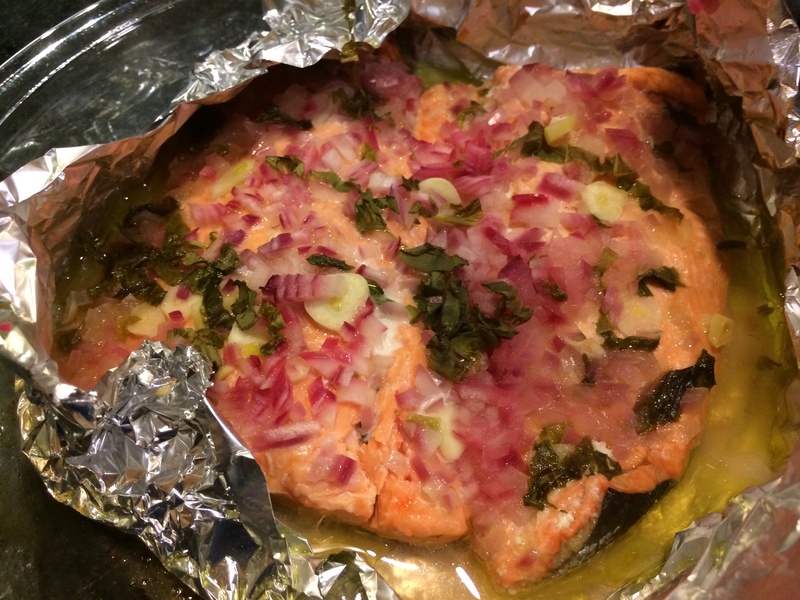 Perhaps I should name this recipe Salmon a la Amazon? But I assure you, no other process is as frugal with flavors as this method. If it makes you feel better think of it the French way: ‘salmon en papillote’ is what they call it. Whether or not the French make better food, they have certainly cornered the market on making it sound better. One, since it is paper, one can wrap the thing being cooked rather tight, and the thing can be very snug indeed. 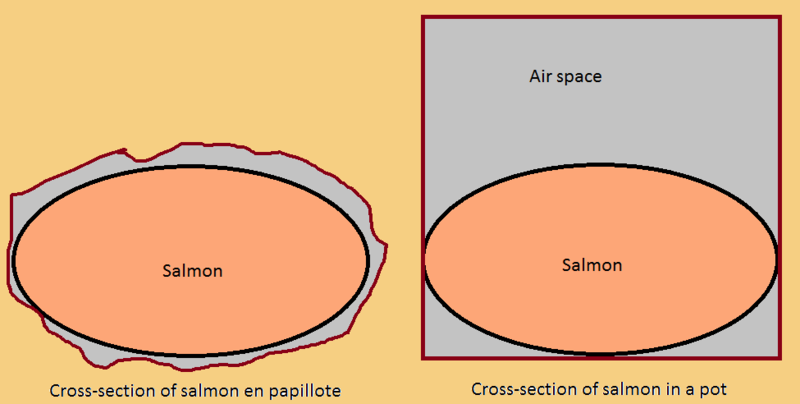 Most vessels are going to have a rather large air space around the thing being cooked — which means, the aromas emanating from it, which one ideally wants to conserve as much as possible of — have a large air space in which to escape to. In contrast when you cook it in a package the aromas stay close to your food, deep inside the package, forming a sort of aroma bomb, waiting to explode when the package is unwrapped at the table. A good sort of bomb, that is. Two — these are the type of stiff papers than one can crimp into a rough air seal. So not only are the aromas staying close by your food, they aren’t leaking out either. The evidence of that? Most of the time when you have salmon or something baking in the oven, your kitchen gets quite suffused with the smells. Normally one swoons over this, but, as the ‘package’ method of cooking sternly reprimands us — the more suffusing into your kitchen that is going on, the less the aromas are sticking around where they belong — right by your food. Three — it is not just the aromas, it is the natural steam that leaves the food as it cooks. Normally this creeps out into the aforementioned large air space, drying out the food stuff; but if you cook in a package, the steam is imprisoned inside, and perforce has to suffuse the food, which then remains moist. Sorry about the analysis but it is nice to know why one does what one does. Or, we could just say ‘en papillote’ and consider the point made. 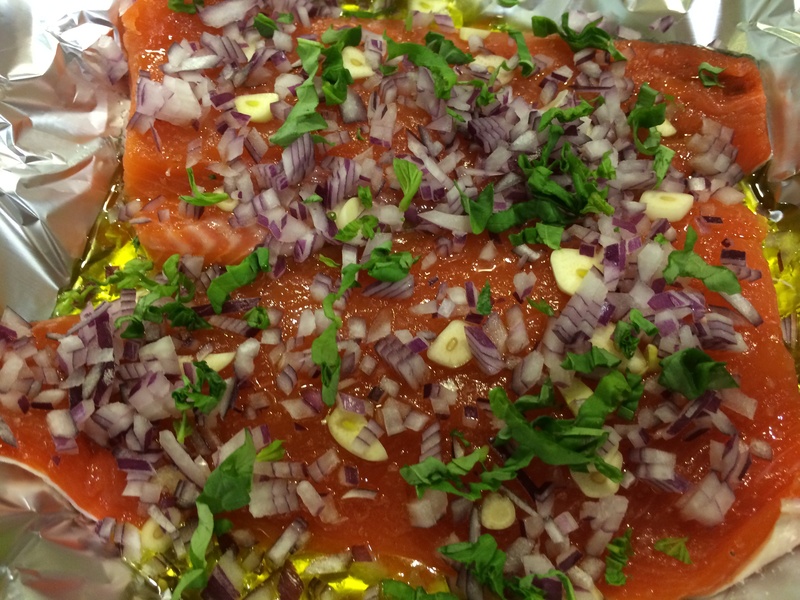 In this recipe, I allow the flavors of onion, garlic and basil to combine with that of salmon. These items are tightly wrapped together so they have nowhere to go except into each others’ arms. This recipe makes enough for a dinner for two. 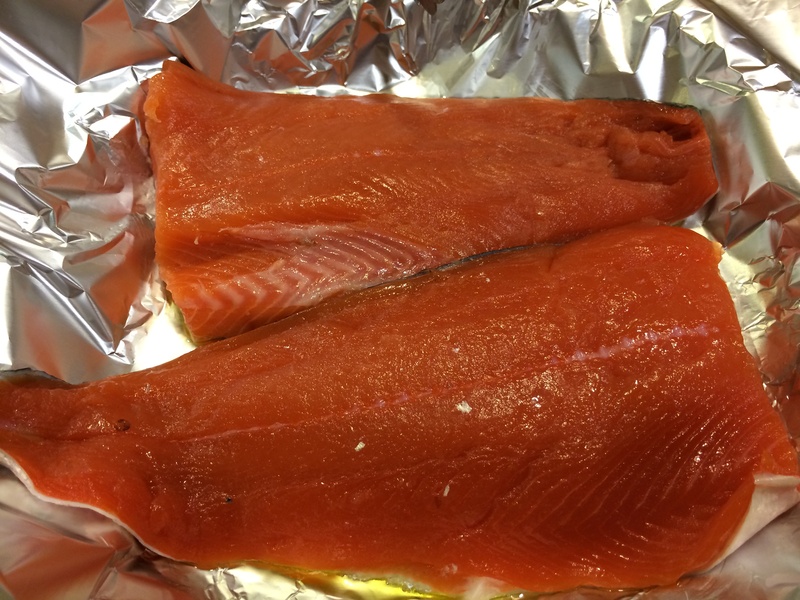 2 salmon fillets — total about 3/4 lb. 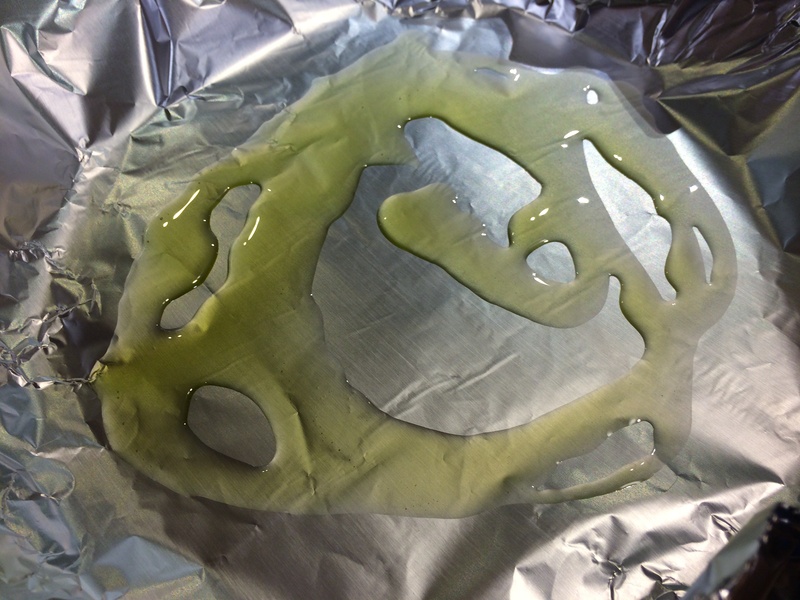 Lay out a piece of aluminium foil 18 inches wide and at least twice that long. Spread a teaspoon of oil on it, then place the fish fillets on, side by side. Spread the rest of the oil on the fillets evenly, then salt them both evenly. Now spread the onion, garlic and basil on the fillets evenly; and then the lemon juice. Now make your pouch. 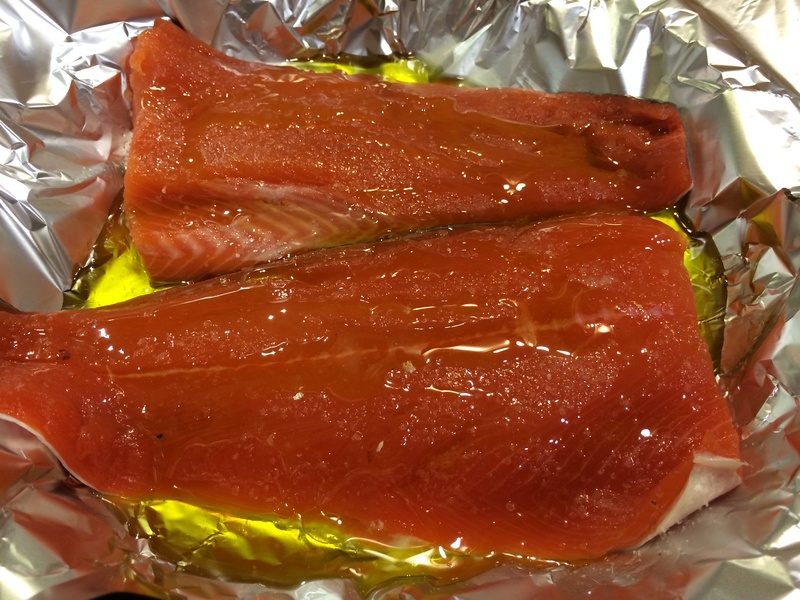 I apologize I forgot to take pictures of this process but you basically fold the edges in, then take the long overhang of the foil over, to cover the salmon completely and fold it under to make a sealed package. Put it in a 400 F oven. In 20 minutes the fish should be done to medium-rare, translucent inside but cooked to a safe 140 F. If you like it cooked more, leave it in for at most 5 more minutes. At this point the fish should be opaque through and through but still flaky. You will know what I mean by ‘aroma bomb’ when you unwrap the package at the table. 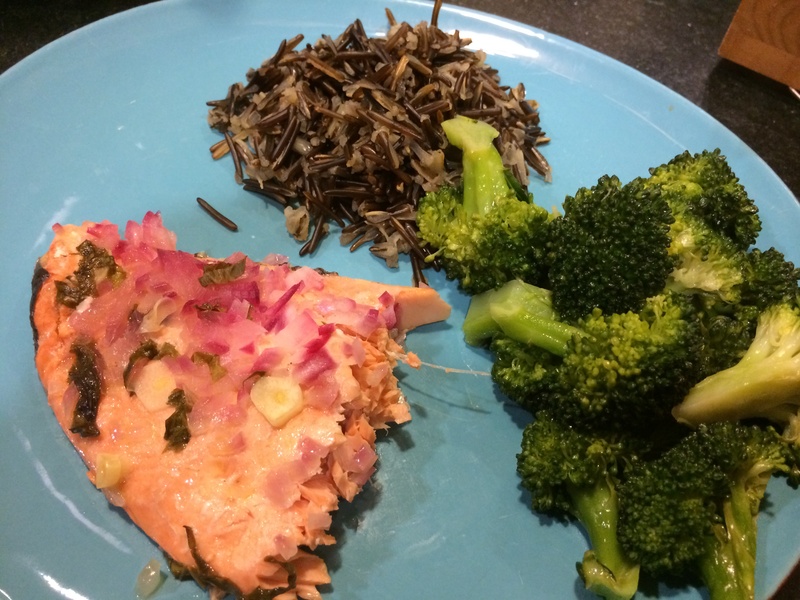 Here is our dinner with a side of wild rice and broccoli.